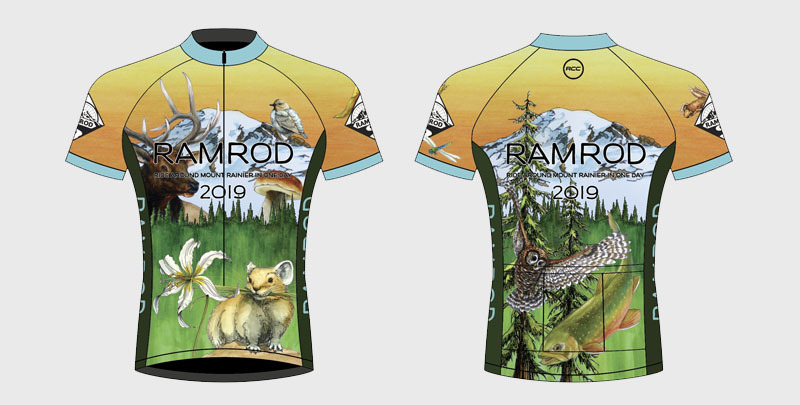 As the artist for this year’s RAMROD jersey, I wanted to showcase a few of the plants and animals that inhabit Mt Rainier National Park. While the physical scenery of the Park is undeniably spectacular, the flora and fauna that make the Park their home are its living skin. Since my background is in Biological Illustration, and with such a wide and diverse list of species to work with, there was no shortage of inspiration or enjoyment as I worked to create the jersey design for your ride. American Dipper (Cinclus mexicanus) This songbird is common on local mountain streams where it dives headlong into rushing water and swims underwater like a penguin while searching for its supper of aquatic insects. Although rather drab in appearance, it is one of my all-time favorite birds for its incredible voice---and its underwater antics. American Pika (Ochotona princeps) would certainly win any cute rodent contest but is a poster child for global warming. Adapted to cold climate high elevation boulder fields and alpine meadows, increasingly rare pikas are being pushed higher up mountain, their available habitat steadily shrinking. Avalanche Lily (Erythronium montanium) As soon as the snow recedes in the spring, these delicate lilies pop up through newly defrosted ground in waves of white. Their wonderfully contradictory name highlights their fragility in an adverse environment. Bull Trout (Salvelinus confluentus) This elegant fish depends on pristine streams with cold, clean water to reproduce - the kind that fortunately still exist in the Park. Known for their strength and fierce dispositions, Bull Trout can surpass all other fish in waterfall-leaping abilities to access high altitude spawning habitat. Coastal Tailed Frog (Ascaphus truei) is both one of the longest lived frogs (up to twenty years!) but also one of the most primitive on earth. If that wasn’t enough reason to admire it, this little guy is one of the only frogs in the world to partake in internal fertilization, its “tail” being a sexual organ vital for successful copulation in a rushing stream where it lives and loves. Elk (Cervus canadensis) The Rocky Mountain elk is at once majestic and iconic and has a convoluted history in the northwest. Anyone who is lucky enough to observe this massive ungulate or hear its haunting call, will not soon forget the encounter. Green Darner Dragonfly (Anax junius) is the Washington State insect. Though supremely beautiful, they are voracious aerial predator taking down large prey on the wing. King Boletus Mushroom (Boletus edulis) are beloved the world over as a choice edible and one of the few mushrooms to fruit in the Cascades mid-summer. These ‘shrooms can grow huge: our personal record is a four pounder which fed the family for days. Mt Rainier (called Talol, Tahoma, Tacoma by local Natives) Recognizable to anyone who has ever visited this corner of the country, “The Mountain” is an active volcano and the most glaciated peak outside of Alaska. The view depicted is the west face which you will hopefully be able to appreciate as you make your way around this grand massif. Northern Spotted Owl (Strix occidentalis) Made famous during the logging debates of the 1990’s, this shy bird only inhabits old growth forests like those still remaining in Mt Rainier National Park. With 90% of its habitat logged and more aggressive barred owls moving in, spotted owls remain highly threatened. Western Hemlock (Tsuga heterophylla), is Washington’s State tree. Whenever I gaze at one of these stately beauties, they remind me of a ballerina paused mid-pose. The organisms illustrating this year’s jersey provide just a glimpse into the rich ecosystems that are woven through the Park’s widely diverse life zones. I hope that as you pedal through this masterpiece of nature, you will glimpse some of the creatures that make this landscape so magical. Enjoy the ride! This year's jersey features oranges and greens with a glacier blue accent for its colorway.